David Hare’s new play The Permanent Way is so topical that the day after it opened at the National Theatre in London, the same subject was covered by The Independent under the headline, “Britain’s Chaotic Railways.” The government ran the British rail system until the early 1990s, when it was privatized and, as a character in the play puts it, “Balkanized.” That means the trains are owned by the banks and rented to train-operating companies, while the tracks are overseen by other companies that hire subcontractors to do the work. The new system values the bottom line over engineering and maintenance of the rails and is seriously compromised, according to Ian Jack in his book The Crash That Stopped Britain. Using Jack’s book as background and urged on by director Max Stafford-Clark, Hare, along with actors under the auspices of Stafford-Clark’s Out of Joint Theatre, took a close look at the growing transportation problem, interviewing rail managers and employees, businesspeople involved with the privatization, passengers and relatives whose lives had been impacted by a number of fatal train accidents. Those interviews form the basis of Hare’s play. Although the piece draws on the testimony of actual people, the characters in Permanent Way have been given generic titles like “A High-Powered Treasury Thinker,” “A Managing Director of Railtrack,” “A Leading Entrepreneur,” “A Widow.” Still, when I saw the production, audience members laughed in recognition of certain portrayals, and journalists writing about the play put real names to some of those characters: the manager director was Gerald Corbett, the leading entrepreneur was Richard Branson, and the widow was novelist Nina Bawden, who lost her husband and was injured herself in one of the accidents that the play explores. When using testimony presumably in the public record, Hare identifies the speakers, in particular the deputy Prime Minister John Prescott. Whether Hare is protecting the generically named interviewees or was not given permission to identify his sources is not clear. Certainly an issue of privacy arises in oral-testimony works performed for the public and preserved in a script, and not naming the actual people can help secure their privacy. 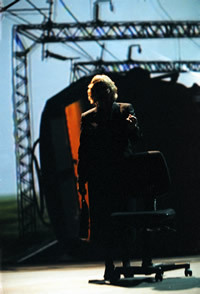 The play begins with a prologue of complaints voiced by a group of passengers and staged by Stafford-Clark as a funny and lively opening number. The actors, each carrying the requisite commuter newspaper, mime traveling in a railway car and mouth off about the Tories, the Labor government, the Underground--becoming passionate about how nothing works in Britain, especially the “stupid” railway system. The rest of the presentation is primarily a series of talking heads. On a relatively bare stage, actors, playing multiple roles, wear iconic costume pieces to identify their characters, sit in different types of chairs, stand in various configurations and mostly use direct address to the audience. Back-wall projections offer a nostalgic vision of railway travel as a train comes alive in a vintage poster and chugs down the track; a disheartening contemporary view of a train stop in need of repair; an arrivals-and-departures board on which the names of stations that have become synonymous with tragedy get ticked off; and later a view of a horrifying train disaster. But what makes this presentation “a good night out” is the compelling material of the first-hand accounts. The story of Permanent Way sketches the background of privatization and its implementation as told by the treasury thinker, a civil servant and an investment banker. Each concedes that the scheme went wrong, but none takes responsibility for its failures. Later, a transport policeman reveals that an investigation into one accident, in which seven people were killed and over a hundred injured, showed that one safety system wasn’t working and another hadn’t been switched on--though it would have been of no help as the driver hadn’t been trained to use it because of company cutbacks. The testimony of parents whose children died in the accidents and survivors of those accidents put a terrible personal face on the tragedies. These accounts of loss and trauma are undeniably powerful. An ensemble of marvelous actors--among them Kika Markham and Out of Joint veteran Ian Redford--portray the wide range of characters, from the policeman in charge of the crash investigation whose disgust at the stonewalling by the rail companies and the government drives him to quit the force, to the founder of a survivors’ group who is so badly burned she wears a plastic mask, to a young survivor who experiences delayed shock and eventually finds a job close to home so that he can avoid train travel, to a bereaved mother who responds to the loss of her son by becoming a social activist. Hare has achieved an effective balance in his play between information, agit-prop and moving personal narrative. He is conscious of the difficulties of dramatizing the subject matter, and more than one interviewee in the play express reservations about making a theatre piece on the subject of the rails: one thinks it might be boring, another that a book would be more appropriate. Indeed, Hare includes a number of intertextual references. Periodically, a character will use his name: “David” (although according to the program notes, a group participated in the interview process). And one character refers to her anxiety about what she’d say when she got to the National Theatre, adding: “I’m grateful to you. You’ve let me come in and talk about something serious.” These interjections remind the audience that the play is based on actualities and that these are real people speaking. Some are self-serving, particularly the line just quoted, but they are effective nevertheless. Some reviewers have complained about the bias in the piece, noting the lack of full testimony from Prescott, who is confined to one-liners. In fact, he is used as a comic device, popping up to deliver brief platitudes. Still, the piece firmly takes a point of view. There is something seriously wrong with the railway system, it says, and both business and government are at fault. Hare and Stafford-Clark are no strangers to political theatre or docudrama, having a history of creating such pieces both together and individually. As an American, I found that much of the play didn’t have the resonance that it did for the British public, who rely on the rail system for transportation, although after seeing the play, I decided to not take any train trips out of London. What did resonate was the individual stories and the willingness of people to share their experiences for this project. And spending an evening at a cultural institution where a play about a topical issue was a hot theatrical event made me particularly happy.